Enjoy an unforgettable meal at the hottest steakhouse in Atlanta. Cuts serves up irresistible short ribs, succulent steaks, and southern classics — such as shrimp and grits in Atlanta and fried lobster tail — along with an excellent selection of wines, beers, and cocktails. 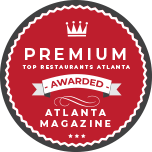 Contact us at 404.525.3399 to make a reservation and discover a steakhouse that is truly a cut above the rest. Cuts is a Southern-style steakhouse and bar located in the heart of Atlanta's downtown dining district, just a short walk from the many of the city's top hotels and convention centers. We offer a fine dining experience with full table service in a business-casual setting. Guests can choose among our main dining areas, semi-private rooms, or comfortable ground-floor patio. There's plenty of parking nearby, and we have cutting-edge AV equipment for sports and special events. Whether you want an intimate meal in front of the fireplace or you want to watch the game with your friends while enjoying great drinks and appetizers, Cuts Steakhouse in Atlanta is the perfect venue. We can also host your next business meeting or event. With more than 20 years of experience in the restaurant industry, we know how to deliver great food and impeccable hospitality to every guest. When you’re looking for a great meal, good conversation, and excellent drinks, visit our steakhouse in Atlanta, GA. Enjoy an unforgettable meal at the hottest steakhouse in town. Cuts serves up irresistible short ribs, succulent steaks, and Southern cuisine classics like shrimp and grits and fried lobster tail along with an excellent selection of wines, beers, and cocktails. Contact us at 404-525-3399 to make a reservation and discover a steakhouse that is truly a cut above the rest. Cuts is a Southern-style steakhouse and bar located in the heart of Atlanta's downtown dining district, just a short walk from many of the city's top hotels and convention centers. We offer a fine dining experience with full table service in a business-casual setting. Guests can choose among our main dining areas, semi-private rooms, or our comfortable ground-floor patio. There's plenty of parking nearby, and we have cutting-edge AV equipment for sports and special events. Whether you want an intimate meal in front of the fireplace or you want to watch the game with your friends while enjoying great drinks and appetizers, our steakhouse is the perfect venue. We can also host your next business meeting or event. With more than 20 years of experience in the restaurant industry, we know how to deliver great food and impeccable hospitality to every guest. Our restaurant serves up more than flavorful and juicy steak. When you’re looking for award-winning Southern cuisine like shrimp and grits, burgers and sandwiches, and sweet desserts like crème brulee and Georgia-style cheesecake. Start your meal with one of our original appetizers, soups, or salads, and be sure to ask your server what the soup du jour is. Are you planning a birthday, anniversary, graduation, or other special dinner? Hold your next special event at our restaurant, or allow us to come to you with our comprehensive catering options for events of almost any size. In order to make sure we’re able to give you the top-quality service you and your dining mates deserve, make sure you call ahead any time there are more than 12 people in your party. Our coordinator will be able to ensure we have a large enough table or even a semi-private dining room available for your party when you arrive. Reach out to our steak and southern cuisine restaurant to schedule your next event or discuss your catering needs. For more than two decades, Cuts has been one of Atlanta’s favorite steakhouses and southern cuisine staples. We use only the freshest ingredients to craft truly original dishes that are full of flavor and color. Whether you’re stopping by on your own for lunch or bringing the entire family to celebrate a graduation or birthday, we’ll make sure you feel welcome and well-fed at our restaurant. Get in touch with our coordinator to schedule a dinner or lunch for more than 12 people. Contact us to make a reservation or discuss your event needs with our coordinator. 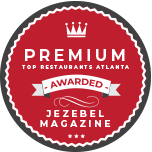 We are proudly located in the heart of Atlanta, Georgia.